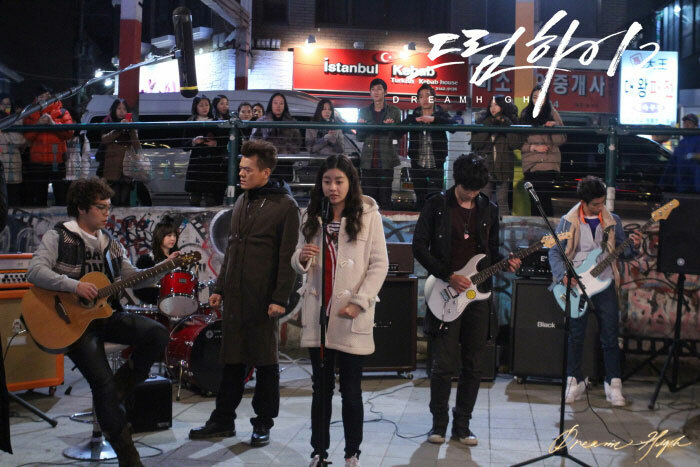 In episode 6 of Dream High 2 broadcast on February 14th, 2012, the program tells the story of Ryan (Park Jiyeon), the member of popular pop group of Kirin Arts Academy Hush, decides to organize a street performance to recover the lost self-esteem. The stills of the street performance was released by the official site. After the joining of the best music teach of Kirin Arts Academy, Yang Jin Man, in the street performance, the students of Kirin Arts High School manage to showcase their talent and present a good show, causing the audience to gather quickly. It’s reported that when the lead actors of the drama, Kang So Ra, 2AM’s Jung Jinwoon, T-ara’s Park Jiyeon, Kim Ji Soo and others went to the location nearly Hongik University for shooting, the people on the street immediately surrounded them, for once caused the traffic jam. Previously, the fans have recorded the scenes and uploaded to Internet, increasing the expectations for the show in drama. The street performance is unlike stage performance, and the cast members are showing a different charms.